What would it take for you to switch mains? NEXT | Watching Blizzard: I need healing! I’ve switched mains in previous expansions, but it never really counted, because it was always just picking up another of my Warriors to play. So while it was a different character, it wasn’t really a big change — it was just, “Oh, I’m tired of playing a Human, let’s see what the Horde is about on an Orc” or “Okay, maybe a Tauren would be more fun.” But with Battle for Azeroth, I’ve switched to a Death Knight and worked hard to get her raid ready — as of this writing, she’s ilevel 341 and raiding Uldir. It feels strange and hard to get used to. I stayed within the same basic weapon and armor types I’m used to, so I have no idea how people who switch from, say, a Priest to a Paladin cope with it. Even still wanting plate armor and two-handed weapons, getting used to a new rotation full of unfamiliar abilities has been an experience. 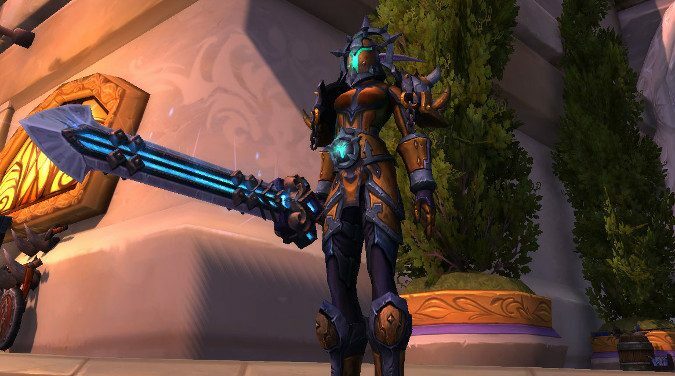 I’m not entirely new to the Death Knight — I leveled her just before Legion came out and played her throughout the expansion — but it is still a pretty big departure. So yeah, I’m curious. Would you ever switch mains? I used to think I’d never let go of my Warriors, but here I am raiding on a Death Knight. Have you done it? Would you ever? What would it take? Would they have to nerf your favorite class into the ground, or could it be as simple as a lore change that makes one feel more natural to play? Do you maybe switch every expansion just for novelty or because your raid group needs more healers/tanks/DPS? What would it take to get you to switch mains?